Quail's Retreat a Luxury Log Cabin w/View! FREE HIGH SPEE INTERNETt! BEST DEALS IF RENTED SUNDAY-THURSDAY! Check our specials as low as $109 per night during the school year! So much to see and do in Pigeon Forge, Gatlinburg or the Smoky Mountain National Parki. During the day enjoy fishing, golfing, swimming or hiking and great shopping! Learn the best kept secret - Spring and Fall are the BEST time to come to the Smoky Mountains - MISS THE CROWDS WITH WEEKDAY STAYS! 'Quail's Retreat' in the Shagbark Community which is very private ('the PEACEFUL side of the Smokies on the right side' but minutes from all the action), a beautiful log cabin home with a great view from the front porch rockers or bistro table. 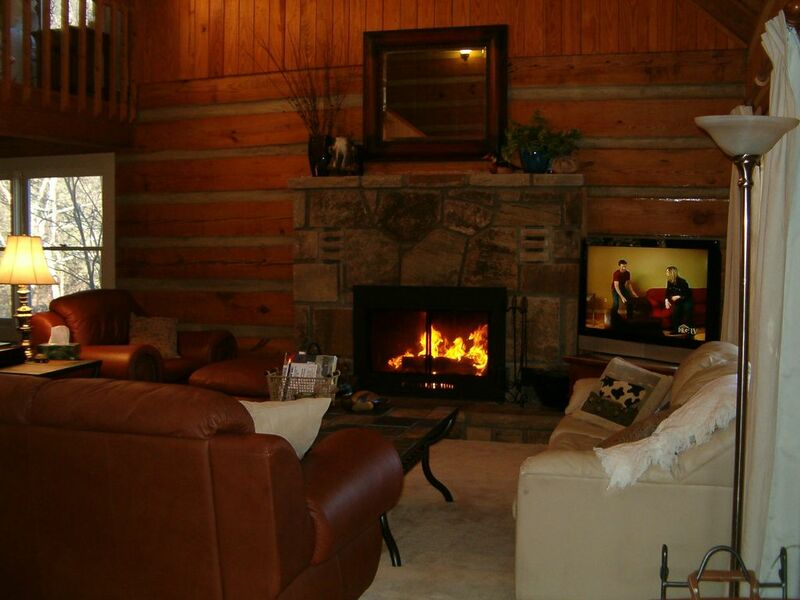 Sink into leather furniture while enjoying the 42' LCD TV or stone wood -burning fireplace. High Speed Internet as Wi-Fi. This luxury cathedral ceilinged cabin has 3 king bedrooms each with 27' TVs, satellite receivers w/DVD/VCR players at most and 2 with electric fireplaces for a romantic getaway. Enjoy the bedroom accommodations or check-out the convertible sofa - one in front of the fireplace, one futon in the forest wrapped sunroom or the in the second floor front bedroom. There is also a futon in the loft in addition to the Queen bed. Hop in the large HOT TUB on the covered back deck or enjoy the POOL or FOOSBALL TABLES in the sunroom. The kitchen has a 21' refrigerator with great ice maker, lots of pots & pans and kitchen gadgets. It is an eat-in kitchen (seats 4) and there is seating for 10 in the large dining room. You will have granite counters in the baths - one with a premier height sink. You will want to come back again and again! We originally bought this as a second home to which we retired. We loved the tranquil setting, the view of the smoking valley and the fact it is close to all the shopping, restaurants, amusement parks for grandchildren and the Great Smoky Mountain National Park. Although we now live across the county close to a daughter and our grandchildren, we invite you to enjoy this lovely log home while vacationing in the Smokies. The cabin handles a large group well. There are spacious rooms - many directions to spread out from the great room to the large sunroom and back deck with HOT TUB, lots of parking, a two car carport to allow for dry unloading regardless of the weather, a level wooded lot, wildflowers that delight the eye, a great valley view and large kitchen with pantry and full sized laundry. GREAT MOUNTAIN VIEW FROM THE FRONT PORCH! BEDROOM WINDOWS LOOK INTO THE TREES ON THIS LEVEL LOT. We were a large group and never felt like we were crowding each other, all the extras were helpful in the kitchen as well as the washer and dryer. We also thoroughly enjoyed time in the hot tub. Took away one star just because it needs some little updates...pool cues, screens missing so we couldn't leave windows open, dresser drawers broken.....and the drive up was semi-terrifying! The good far outweighed the bad and we really enjoyed ourselves! Great value for what we paid. The only way I can explain my stay would be to say it was absolutely perfect. I highly recommend staying here. It was beautiful! Beautiful cabin, peace and solitude, close to everything fun! The cabin is beautiful and well-stocked with everything you need. Having full use of the kitchen saved us lots of money from eating out. We enjoyed the hot tub nearly every day. While we didn't anticipate how high it would be on the mountain, we really appreciated how quiet it was there and no traffic to speak of. Gorgeous views. There is plenty of room in the cabin for a small group without feeling crowded. Overall, we just felt it was very cozy, comfortable. We couldn't have been happier with our choice. the photos don't do it justice. All the communication before our trip was clear and excellent. We'd definitely stay here again. The cabin was well stocked and set up for the getaway. The stay was pleasant and quiet except for the kids. Only drawback is the steep roads getting to and from. Make sure you put the vehicle in low gear. This was the perfect place for our family while we were in the mountains for my brother's wedding. The kids enjoyed playing pool while the adults enjoyed sitting around the fire. Can't wait to go back for a vacay!! A very private cabin. My son lost his wallet first day. everyone was so helpful getting it back to him when found. Cabin was awesome. Does need to be updated and needs a little TLC. Would use this cabin again. This cabin is in a beautiful private resort with plenty of space between cabins. Close to Dollywood, Splash Country, Golf Courses, the Artist/Craftsmen Loop, Gatlinburg, Pigeon Forge and the Smoky Mountain National Park. Clean fee $105 per stay - Tax 12.75% added to the total $100 deposit to hold your dates and the balance 30 days before check-in Credit/Debit Cards - VISA, MC, Discover, money order or personal checks accepted Book a week and the 7th night is free. Contact for revised amount. Note: Until confirmed, rates are subject to change without notice.